An anthropological study in PLoS ONE, an international peer-reviewed online scientific journal, suggests that dog has been man’s best friend for much longer than previously thought. The longstanding belief about human-canine relationships is that the world’s earliest dogs were mere work animals used to hunt game, but it turns out 7,000 to 8,000 years ago, Early Neolithic Siberian foragers had a soft spot for prehistoric Fido. By analyzing 17 canine burial sites throughout the region, a team of anthropologists was able to determine quite a bit about the relationship between ancient Siberian foragers and their canine companions, which scientists believe looked a lot like large versions of the Siberian Husky. University of Alberta anthropologist and lead author of the study Robert Losey says dog owners commonly lived near bodies of water, and the Lake Baikal region in modern day Siberia, as well as the areas near the Angara and Lena Rivers, seemed to fit the bill. By examining sites in these areas, Losey and his team discovered that these Neolithic foragers and their dogs subsisted on the same diet, which included a lot of fish and seal. “Dog burials appear to be more common in areas where diets were rich in aquatic foods because these same areas also appear to have had the densest human populations and the most cemeteries,” Losey tells Discovery News. While humans in largely pastoral communities seemed to rarely bury their dogs after death, dogs who lived in hunter-gatherer communities like those in Siberia seemed to share a close and personal connection with their people and were often buried ceremoniously — and not as a celebration of the canine’s hunting skills, evidence suggests. 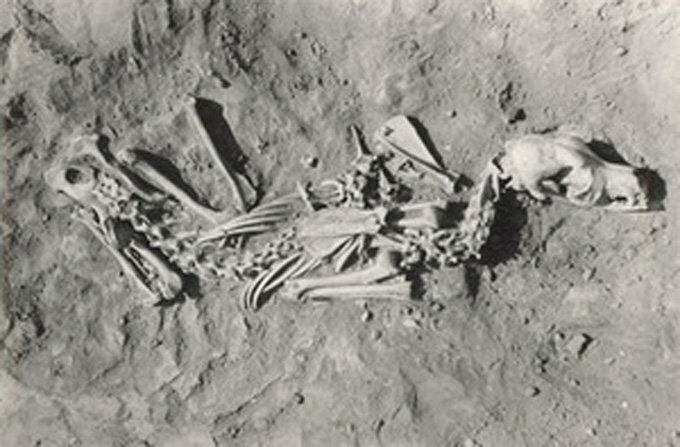 “If the practice of burying dogs was solely related to their importance in procuring terrestrial game, we would expect to see them in the Early Holocene (around 9,000 years ago),” Losey explains. The level of care with which these dogs were buried — alongside treasured items the dogs likely used everyday, and in some cases alongside their human companions — suggest a special bond must have existed between these ancient peoples and their four-legged friends. Unearthing another site revealed the skeleton of a man who was buried alongside his two dogs, the remains of each dog carefully placed to the left and right of the person. Maybe the most interesting — and heartwarming, even — burial site contained the ancient remains of a dog whose owner lovingly placed a necklace made of four red deer tooth pendants around the pup’s neck, a necklace fashioned in the same style as others worn by humans of the time. Perhaps the necklace was the forager’s way of honoring his best friend. “People came to know them as unique, special individuals,” he adds.